Regular, broad, meditative and transformative reading of the bible is an indispensable foundation for anyone seeking to develop a Christian mind to the glory of God, but we understand God’s word and its implications better when we do so in dialogue with others who have meditated deeply on it. Like dancing or learning to play baseball, developing a Christian mind is far more satisfying and much more fun if it is undertaken in community. As Christians in higher education we know that forming a Christian mind comes in large part as we “read, mark, learn and inwardly digest” biblical truths, but we sometimes find it difficult to know where to start. In this post I offer two principles to inform what we read and how we read it, and a bibliography of essential books, audio talks and websites for shaping our thinking as Christian scholars. The first principle comes from C. S. Lewis, in his essay ‘On the Reading of Old Books’, from God in the Dock: ‘It is a good rule after reading a new book, never to allow yourself another new one till you have read an old one in between.’ It has often been said, and wisely, that new books are much more likely to share our contemporary blind spots and misunderstandings than books written in and for a previous age. In forming a Christian mind we will do well to draw on the wisdom of the past 2000 years, not just on the past 20. The second principle is a plea for re-reading. There has never been as much extensive reading as today, especially in academia: we read more in magazines, on blogs, in journals and in books than ever before. The sadness is that, for many, this has come at the cost of a dramatic decrease in intensive reading: the slow, repeated, thoughtful assimilation of an important text by repeated re-reading and reflection, to the point where it becomes difficult to know where our own thinking stops and the text begins. As academics and students concerned to form a Christian mind it is crucial that we do not neglect intensive reading as we become buried under the avalanche of our extensive “to-read” piles. We can’t read and re-read everything intensively, so it is important to choose our personal treasury of intensively read books wisely; these well-worn volumes will become our precious dialogue companions on our academic journey, shaping the way we approach any problem or question both in our academic discipline and beyond. Books belonging to my own personal treasury are indicated on the list below with an asterisk. I don’t agree with everything in any of them, but they have taught me – and continue to teach me – how to think. Think about your own personal treasury of books you want to assimilate in this way, and return to those books regularly. I would encourage you to re-read half of your intensive list every year (so don’t make it too long! ); you will find that you gain new insights from the old favourites each time. Most of all, don’t think that all your reading needs to be new reading. Re-reading a book from your personal intensive treasury can often be more fruitful for developing your thinking than hurtling through one more new release. Think back to all your Christian reading over the past year, and write the title of each book you have read in one of the squares below. 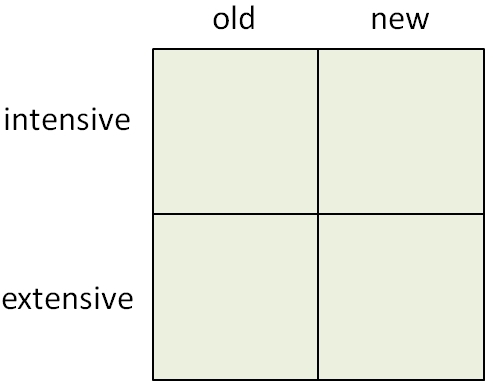 Note which squares are under-represented and which are full to bursting, and determine how you will balance up the four categories this coming year. If you don’t have much to enter in any of the squares, then don’t despair. This is an excellent opportunity to start being intentional about your Christian reading over the coming year, and to accelerate the formation of your own Christian mind. Start by reading one book for each square, and give yourself a month to read (or listen to) each volume. If no-one has ever taught you how to read a book, then head straight for Mortimer Adler’s classic, appropriately titled How to Read a Book. Brian Fulthorp has a great series of posts on it over at his blog sunestauromai. I went through my whole undergraduate degree and got half way through my doctorate before a friend casually mentioned this volume to me, and since then it has been a huge help in making efficient use of my reading time. The list of books below contains no works of fiction, though the thinking Christian scholar would do well to immerse herself in a mixture of ‘old’ and ‘new’ novels, stories and poems as well as nonfiction material, not least because the bible itself is generically varied and because understanding different genres of writing develops different faculties and sensitivities, reflecting the inter-connectedness of the whole person in the image of God. The use of our different faculties is like the use of the various doctrines of scripture: heresy arises not just from affirming the wrong things, but affirming the right things in the wrong proportions. We need to maintain healthy proportions in our reading: all ‘fact’ and no ‘fiction’ leaves our sensibilities disproportionately developed and leads to an uneven, limping gait both in scholarship and in life. The list below offers my personal selection of some of the best ‘old’ and ‘new’ books that have helped me to think in a more biblical, Christian way about life and my studies. The list is by no means exhaustive, but my hope and prayer is that it can offer a place to start. CCEL = The book is freely available at the Christian Classics Ethereal Library (CCEL.org). LibriVox = A free audio version of the book is available at LibriVox (librivox.org). * = the book is part of my own personal treasury of intensive texts which I seek to re-read and assimilate. Christian Apologetics Past and Present: A Primary Source Reader: Volume 1, To 1500. Christian Apologetics Past and Present: A Primary Source Reader: Volume 2, From 1500. Is there a Meaning in This Text? The following websites have been a huge help to me over the years, showing me how to think about the content and the process of my discipline in a biblical way. www.bethinking.org. Many useful apologetics and worldview talks, audio and video, from the Universities and Colleges Christian Fellowship in the UK. http://www.labri-ideas-library.org/. An impressive audio library of talks on many Christian worldview issues by Francis Schaeffer and others. http://veritas.org/talks/?view=all-talks. The archive of the Veritas Forum, which “creates events engaging students and faculty in exploring life’s hardest questions and the relevance of Jesus Christ to all of life”. They also have a youtube channel. http://feeds.feedburner.com/albertmohlerthinkinginpublic. An occasional show in which Albert Mohler, President of the Southern Baptist Theological Seminary, interviews both Christian and secular guests on a range of worldview issues. http://www.allofliferedeemed.co.uk/. A repository of thoughtful reflection on the important Dutch reformational philosophers, notably Abraham Kuyper, Hermann Dooyeweerd and D. H. Th. Vollenhoven. http://www.oxfordchristianmind.org/. The “developing a Christian mind” initiative at Oxford University “provides space for postgraduate students, post-docs and faculty to consider how they integrate their Christian faith and their academic life”.